What are the Best Fishing Kayak Products Right Now? So you are ready to join the ranks of fisherman who have discovered the total freedom that kayak fishing can offer them? Freedom to get to where the fish are without the headache of a full sized boat. Freedom to get out on the water, without the effort of lugging a full boat trailer behind you. Freedom to fish where you want, when you want. So now the only question is, which is the best fishing kayak? The answer to this question is going to depend very much on several factors. Where are you fishing? Freshwater or ocean? How much experience do you have with other type’s watercraft? How physically fit are you? Your choice of best fishing kayak is going to very much depend upon these answers and more. So for the purpose of this article, we will split things up, we will look at the best fishing kayak for beginners, and for experienced kayak fishermen, examining the best budget, midrange and top of the range options for each. Safety – hands down the most important consideration for beginners looking for the best fishing kayak. Kayak fishing uses a hybrid skillset. You need to know how to fish (you probably do already), and you need to learn how to handle a kayak safely. As a beginner, concentrate on the kayak skills first, and for this you need a nice safe kayak just in case something goes wrong. This pretty much means that in this category, we are only going to be looking at sit-in fishing kayaks, they are much safer than sit-on fishing kayaks for beginners. Good Handling – Many of the more advanced fishing kayaks add extra features that can actually get in the way of handling the kayak itself. So for a beginner, we want something that makes actually handling the kayak itself as simple as possible. Adaptability – When you first get in to kayak fishing, you probably won’t know just what style of kayak fishing you are going to enjoy most, so we need a beginner kayak that is capable of being used in a wide range of fishing situations. This is actually a very tough category to fill. Finding the best fishing kayak for beginners, at a low price point, is not easy. The real danger here is to be tempted by one of the inflatable kayak products, marketed as fishing kayaks. Do we really need to explain what happens when a fishing hook gets stuck in an inflatable kayak, and then pulled out? Seriously, do not even consider an inflatable kayak for fishing, even if the manufacturer says it is a specialized fishing kayak. Luckily, Sun Dolphin, a well-known manufacturer of good quality, yet low-cost kayaks comes to the rescue with the Sun Dolphin Excursion Sit-In Fishing Kayak. This is a great, inexpensive kayak that really does tick all of the boxes when it comes to beginners. Sturdy construction, with the basic features every fishing kayak needs such as rod holders (including a very useful swivel holder), a large watertight compartment for equipment and bait, and lots of deck area secured with deck rigging. Why did we choose this fishing kayak? 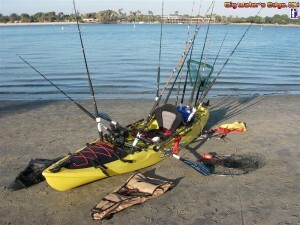 Excellent, low cost sit-in fishing kayak, very safe and easy to handle. Moving up a notch, we are now looking for something as practical as our budget selection for beginners, but with a few more useful features and a little more versatility. For this category, we are going to choose another Sun Dolphin product, the Sun Dolphin RED Aruba 8' Sit-in Lightweight Kayak w/ Drink & Paddle Holder. With a price tag of around $520, this is a lot of fishing kayak for the money. In many ways it is something of a big brother to our budget choice. This is a very light, yet long fishing kayak, that 12” length really adds to stability, making it suitable for most freshwater venues, and many sea venues. This is again a sit in kayak, making it nice and safe for beginners. It comes with standard equipment such as rod holders, but its big bonus feature is the Portable Accessory Carrier (PAC). This is a large, detachable, waterproof storage bay, that means the Sun Dolphin BLUE Aruba 12' SS Sit-in Lightweight Fishing Kayak w/ Rod Holder is great for those longer fishing trips. Load up on supplies, detach the PAC somewhere suitable to lighten the load, then go back for it when you need those supplies again. Why did we choose this fishing kayak? Stable, longer fishing kayak at a good price, able to tackle more advanced venues. Good capability for extended fishing trips due to luggage carrier. This category, once again, is hard to fill. Finding the best fishing kayak for beginners, at the top level price point is tricky. We don’t want to go too expensive, as eventually most people will upgrade their beginners kayak. But we do want some extra features and adaptability over the previous choices. We choose the Riot Kayaks Edge 11 Angler Flatwater Fishing Kayak for this category. A very stable sit-in kayak, and the first steerable kayak we have talked about so far, using a skeg to steer without paddles. This is a very spacious and comfortable fishing kayak, with lots of deck top stowage space, all secured with deck webbing, both in front and behind the fisherman. It can also fit a spray deck, great for bad weather fishing, or more lively waters. The inclusion of a large waterproof stowage bay is also very welcome. At around $850, this is still a pretty cheap fishing kayak, with much more adaptability than our two previous choices. Why did we choose this fishing kayak? Excellent bad weather/rough water design including a spray deck. Steerable without paddling. Large deck space for equipment. Now we will take a look at the best fishing kayak in the budget, midrange and top of the range categories for an experienced kayak fisherman. This means we are going to look at sit-on kayaks, which offer more freedom of movement. We are also going to be looking for advanced features such as gear mounts for fish finders, GPS etc. And also possibly a trolling motor mount. We also want to find kayaks that are entirely suitable for blue water fishing. Something else we need to consider here, is actual build quality. Advanced kayak fishermen can potentially hook and land some truly big fish, especially in blue water. The last thing you want when you are fighting a big grouper, or even a marlin in a kayak, is the thing falling apart under you. As an experience kayak fisherman, looking for the best budget fishing kayak, you are basically going to be looking for three things. A sit-on kayak, able to tackle both blue water and freshwater fishing, with plenty of space and room to stow lots of gear. So for this, we choose the Ocean Kayak Prowler 13 Angler Sit-On-Top Fishing Kayak, Urban Camo. At just under $1000 the Ocean Kayak Prowler 13 Angler Sit-On-Top Fishing Kayak, is one of the cheapest, fully multi-role fishing kayaks around. Very stable at 13” in length, it is equally at home on a rapid river, or out beyond the surf. At this price we are not going to get many advanced features, but what we do get, is a very capable kayak for people on a tight budget. We have a very useful front hatch, secured by webbing, and a huge waterproof rear tank that can stow massive amounts of gear, even a SCUBA tank or two if required. Plenty of deck space, and a wide design make it a comfortable fishing kayak to move around on. The only thing we would improve on, is the fact it only comes equipped with two rod holders. Why did we choose this fishing kayak? An incredibly priced fishing kayak that can tackle everything from placid lakes, to rough ocean venues. Moving up to the midrange bracket, we want something that is versatile, as our last selection was, but also very comfortable, with excellent advanced features and a great build quality. For this, we need to take a look at one of the most respected fishing kayak manufacturers in the world. FeelFree. In fact, we are going to recommend the Feel Free Lure 11.5 Fishing Kayak 2016. This is a fairly short fishing kayak for blue water use, but it is entirely capable of handling even the roughest water. The FeelFree Lure 11.5 has incredible build quality, yet it gives up nothing in usability due to its more robust build. A very comfortable sit on fishing kayak, with a large padded seat, this is a great choice of older kayak fisherman. At around $1,150, it is very well priced considering the features. Most notably, the very wide deck, which has been designed to allow people to actually stand up and cast! Something almost unheard of for kayak fishermen. It also has the usual waterproof bin but in the front this time, leaving space for a very useful hatch just behind the fisherman. Plenty of gear points are included for clipping items of tackle too, and there is even a limited mount for a trolling motor. Why did we choose this fishing kayak? An amazing combination of functionality, adaptability and comfort, all built to very high quality. For this last category, we are going to look at something different. If you are an advanced kayak fisherman, looking for something top of the range, then this almost definitely means you want something capable of landing even the largest fish, in the most challenging waters. We are not looking for comfort, we are not looking for masses of storage space. We are looking for a very safe and stable fishing kayak to use in fairly deep swell far offshore. We need to be able to mount a trolling motor, and we need to be sure that no matter how large a fish we hook, we can apply power and leverage at all angles. So we are opting for the NuCanoe Pursuit 13.5' Storm Grey Fishing Kayak. At a little under $1,700 this is still not a wildly expensive fishing kayak. But it is a very capable one. The NuCanoe Pursuit 13.5' Storm Grey Fishing Kayak is not pretty, but it is entirely functional. An ultra-wide, 13.5” fishing kayak that is designed to do one thing, and one thing only… catch big fish. Towards this goal, the adjustable seat is designed to allow any fisherman to find the best height, enabling them to use their legs, when fighting big fish. Not a lot in the way of storage space is included, but if you are out in the deep blue, you are probably only using a trolling rod or two, so you don’t need to carry much gear. Coming back to trolling, this kayak can mount a fairly powerful trolling motor, up to 2.5HP. This means that even a small petrol outboard can be used for sea venues with a strong current. Why did we choose this fishing kayak? For one reason and one reason only, it can land any fish, anywhere. A powerful fishing kayak that takes no prisoners. So, if money were no object, what would we choose as the best fishing kayak ever? Well, it’s tough to say. Paying $3,000 or more for a fishing kayak does not mean it is going to be better than something cheaper. For example, our last selection, the NuCanoe Pursuit 13.5' Storm Grey Fishing Kayak is hard to beat for landing big fish in deep waters, and it only costs around $1,700. Paying more won’t get you a better fishing kayak for this particular task. But if we had to choose a dream fishing kayak, it would be the Hobie Mirage Pro Angler 14. Coming in at $3,200, this fishing kayak does it all, and in comfort. From lazy lure fishing for bass, to offshore trolling for sports fish, this is a super fishing kayak. Very stable, and easy to handle, with a fitting for a trolling motor. What we really like about it though, is the masses of space for gear stowage. In theory, this could be a multi-day fishing kayak, as it has room to stow full camping gear as well. It’s almost a hybrid between a fishing kayak and an adventure kayak. And for us, this is the best fishing kayak.